This post for my mom’s pizza, or better said, Nonni’s Italian Pizza is a feature for the toppings. We visited my mom in fall a few years back, and the entire trip was a foodie trip. My mom was busy, busy busy in the kitchen. Making everything from her fried chicken cutlets, to her risotto. Nonni’s Italian Pizza made it in there too. We tend to make Friday nights, pizza night in our house. It’s something we all look forward to, tucking in on the sofa, watching a movie, and eating our pizza. Well, my mom’s version was slightly different than mine. I tend to use the same standard toppings which are mozzarella, tomatoes and mushrooms. 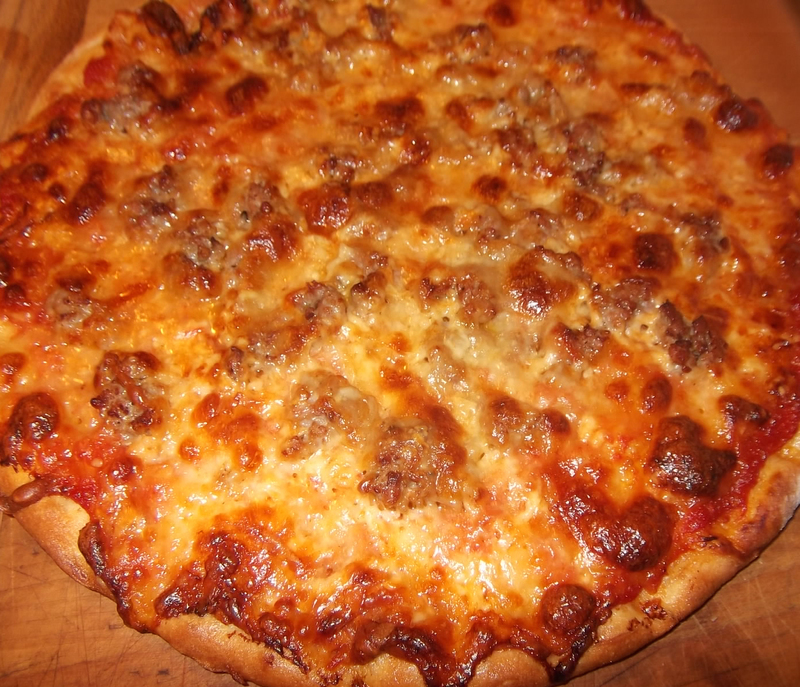 My mom had a few different options going on this evening, but the best we all thought was her Italian Sausage Pizza. She’s a big believer in adding manchego cheese and cheddar to the mozzarella. Hey, it was delicious! The sausage was an added bonus too. Just a bit different to my pizza post, but the toppings were delicious. Prepare the dough use the standard recipe from my website, it’s the best! add a bit of olive oil on the dough once it’s been spread out on the pizza tray. I prepared the pizza’s @ my mom’s house by spreading out the dough with my fingers (no rolling pin), adding a bit of olive oil, then the toppings. My mother said the pizza crust came out much nicer than hers normally does. More crunchy, less soggy. Once the dough is all spread on the tray and oiled, layer your toppings. Sauce first, then cheese, then meat, then oven.